Yes that photo above is slightly over-the-top, with a slightly over-the-top statement, but I truly do believe in Seattle’s storytelling secret sauce. That’s because it’s a claim that goes beyond 20th century mass communication equivalencies of media (New York City) and entertainment (Los Angeles). It’s not just about the creation of content for consumption, but the level of connection and accountability tied to that content. This has always been a region rich in social capital and community; now that we’re free to create and distribute stories without institutional permission, we can inspire new kinds of relationship with content. That’s what I tried to explain to the Seattle office of PR firm Weber Shandwick (which sponsors our Four Peaks TV show) in my Q&A a few weeks ago (pasted below). It’s in service to our community that my graduate program is co-sponsoring — and I’m emcee’ing — the Seattle Chamber of Commerce’s IN-NW 2013 conference about social engagement this week. It’s also why I say Four Peaks is not just about producing a compelling show for TV — it’s also adding the influence and social capital of our guest to our growing network that we will regularly employ and deploy to serve our community of students, faculty, alumni and fellow professionals. If as 21st century communicators, our overall challenge — and opportunity — is one of engagement, then we must maximize whatever currency is available to us to facilitate that engagement. Astonishingly, Nielsen reports that while viewership is down on TV, it’s up on other devices, to the point that the average American watches 4 hours and 38 minutes of television somewhere — a day. So we’ve been experimenting with second screen strategies to support the show, and recently convinced UWTV to stream the shows online, even before they’re broadcast on its channel. That’s pretty courageous for a station that wants to maximize our show’s on-air ratings (which are already exceptionally healthy), but recognizes that real-time, on-demand multi-platform engagement is now equally important. Where you find the raw material that is attention, you can now also make the effort to refine it into a sustainable relationship. So advertisers will pay through the teeth for Super Bowl placements replete with Twitter references, given that the last three years have produced the most watched TV events in the history of the medium. And watch below for my conversation with the amazing musician, creative entrepreneur and TED Fellow, Meklit Hadero. We end up jamming on our guitars near the end. 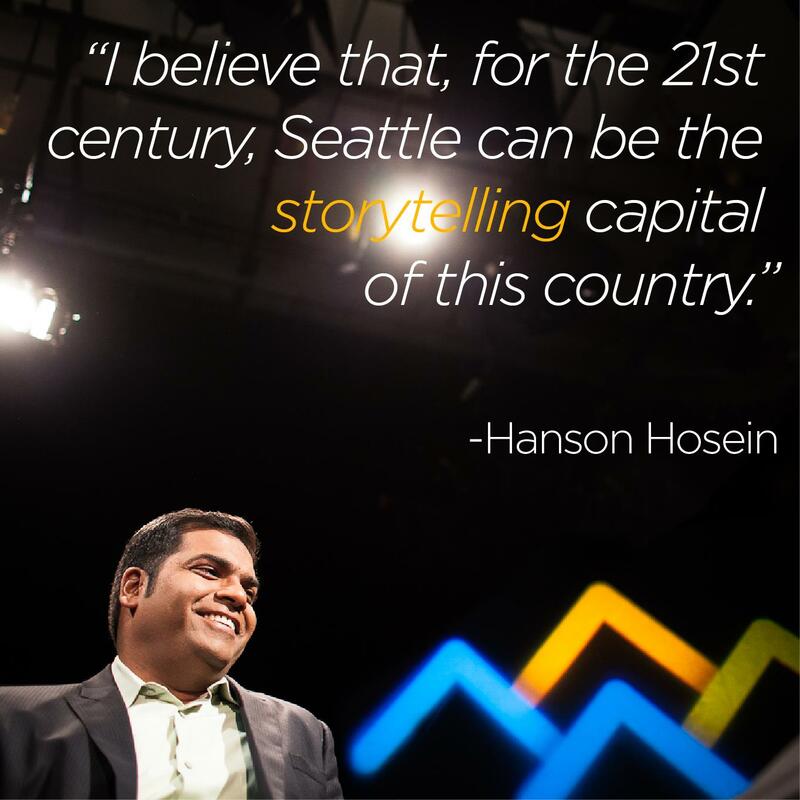 Q: Why do you feel that “Seattle could be the storytelling capital of the country in the 21st century” and what do you feel differentiates Seattle from other cities? A: Storytelling is not just “once upon a time,” nor is it a template for a cold set of facts tantalizingly reordered. It once was, and now is again, about the sharing of an inspirational idea with emotion and accountability. It implies a direct connection to a community (once the mainstay of minstrels and oral storytellers, pre-mass media) in a sustained feedback loop between audience and storyteller. Seattle is an ideal capital for this kind of informational transaction: we have the creativity, the community orientation, as well as the entrepreneurial spirit of interactivity, along with the technological innovations to support it. It also helps that our weather isn’t the greatest, which forces us to dig deep and find inspiration within, as well as to seek out connections in novel ways. Q: What does the Four Peaks story look like? What message do you want the program to convey to the Seattle community and beyond? A: The Four Peaks program is ultimately about using a traditional medium (television) and newer, transmedia strategies to promote the unique thought leadership of our region (orchestrated by the show’s Executive Producer Scott Macklin and our students). The “Peaks:” innovation, entrepreneurship, community and entertainment are unique elements to the Pacific Northwest and all of our guests reflect them in one or more ways. We want to provoke our guests into thinking through their work — and sharing it — in ways they haven’t before. Four Peaks is meant to inspire a community of professionals who seek to extend their reach through a mutual desire for new ideas, lifelong learning and influential networks. So I’ll ask a guest such as Jane Park (who’s building a national beauty brand at Julep) to share her current challenge, and I’ll attempt to resolve it through an on-air consultation. At the same time, we also have a “Teach Hanson” segment where I learn something from the guest. It’s a reciprocal relationship, which is crucial to all healthy networks. Q: What drove you to develop Four Peaks and what do you see for its future? A: Simply put, thanks to technology (devices, online platforms) we’re inundated with content and our attention is maxed out. 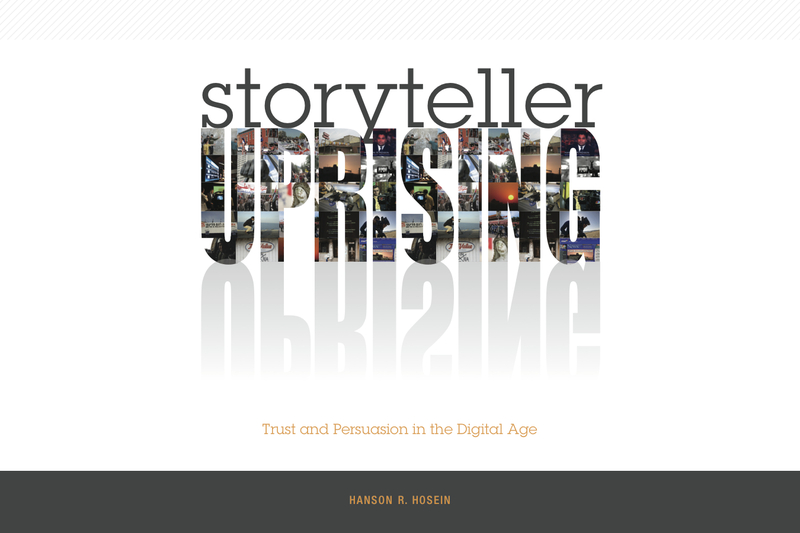 So if we’re going to connect to others in persuasive, trustful ways, we need to leverage whatever attention-raising powers we have to engage. Despite the disruption that digital has brought to traditional media, television continues to thrive. Americans are actually watching more TV now than ever. However, they’re not necessarily doing so on TV sets. And given my background as a former TV journalist, and as a present-day digital media educator/strategist, I have a unique opportunity to create the kind of quality content that people might want to pay attention to, and leverage multiple platforms to continue that relationship of engagement. The future of the show may involve an even greater diversity of public figures, including some household names from our region. We’re increasingly being pitched by potential guests, which means we must be doing something right. Q: How do you identify and choose guests to spotlight on Four Peaks from such a rich community of local storytellers, entrepreneurs and creative minds? A: We want to find people who are doing unique, forward-facing work and who correspond in one way or another to our “Four Peaks criteria.” Are they innovative? Entrepreneurial? Are they connecting in unique ways to a community. Are they creating compelling content? And equally important, would our network (students, faculty, alumni, partners) benefit by entering into a relationship with them in a high-profile, public kind of way? We’re very public-facing as educators, and are constantly connecting to accomplished people who would make great guests on the show. Q: What does “engaged storytelling” mean to you and the UW MCDM program? What are some of the most critical teachings that apply to storytelling? A: Storytelling itself actually involves two crucial acts: “telling” a great story that captures one’s attention and “listening” for a reaction — that creates an opportunity to sustain engagement. We’re going to double down on this premise with our new Communication Leadership program starting in fall 2013. “The Communication Leadership program houses unique degree emphases in digital media and creative engagement. The program guides professionals into transformative roles through the design of networking strategies, anchored in compelling storytelling and insightful analytics. Professionals build the necessary communication knowledge, strategies, and skills to manage content, information, systems, people, and change. During the current season of Four Peaks, Hanson has tapped into some of the region’s most creative, visionary and entrepreneurial storytellers. From nail salon tycoons and musicians to digital mavens,authors and tech trade writers, their stories are fascinating and revealed the innovation and entrepreneurship that abounds in our community. Be sure to catch Hanson’s Four Peaks interviews on UWTV (Comcast, Channel 27) on Tuesdays at 7PM and on Northwest Cable News (Comcast, Channel 2) on Saturdays at 4PM and Sundays at 9PM. Previous shows stream on uwtv.org/fourpeaks. Previous:New screens for old: is 4K OK for storytelling?